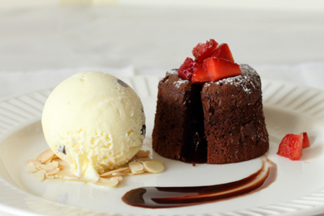 Individual sized chocolate cakes filled with smooth melted chocolate and paired with a scoop of Kemps Chocolate Chip Ice Cream. Perfect for sharing with your sweetie. Spray 2 custard cups with nonstick cooking spray. Combine the butter and both types of chocolate in a medium bowl. Microwave until all is melted. Add powdered sugar until well combined. Whisk in the eggs and egg yolks. Add the vanilla extract then stir in the flour. Divide the batter between the two custard cups. Place custard cups on a baking sheet and bake for 10-13 minutes. The sides will be firm but the centers soft. Remove from oven and let cool for 1 minute. Pop out unsidedown onto individual serving plates. Top cake with a dusting of powdered sugar and optional fresh berries and nuts. Serve warm with a scoop of Kemps Chocolate Chip Ice Cream.